Both ends are threaded for quick and easy connection. 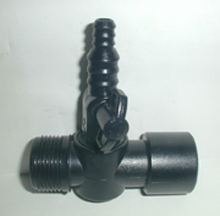 Diverter end is barbed where you slide tubing of 1/2" ID over end to diverter water to another area. This can either be turned on or off and with the handle you can adjust the water fllow to the diverted area.